Random thoughts: This is part of my series on Hard Ciders. Fox Barrel is owned by Crispin Ciders. This is the second of Fox Barrel's three pear ciders I've tasted. The first was Pacific Pear. The tasting: Deep purple in color, clear, with lots of effervescence floating to the top. When I first smelled it, the aroma reminded me of concord grape juice. After waiting for a few minutes, blackberry was at the forefront. The pear was noticeable, but was much more subtle. In flavor, the blackberry dominated. Again, the pear was not strong in flavor, but did provide a touch of sweetness. Blackberry Pear is light to medium bodied with effervescent carbonation throughout the taste. It's sweet, but not as sweet as I expected (Pacific Pear was sweeter). It finishes with tart blackberry. Rating: 3 star. Good. I would drink this again if someone gives it to me. I liked Blackberry Pear. It has a nice clean berry flavor, has some sweetness, but isn't cloying. I preferred it over Pacific Pear. 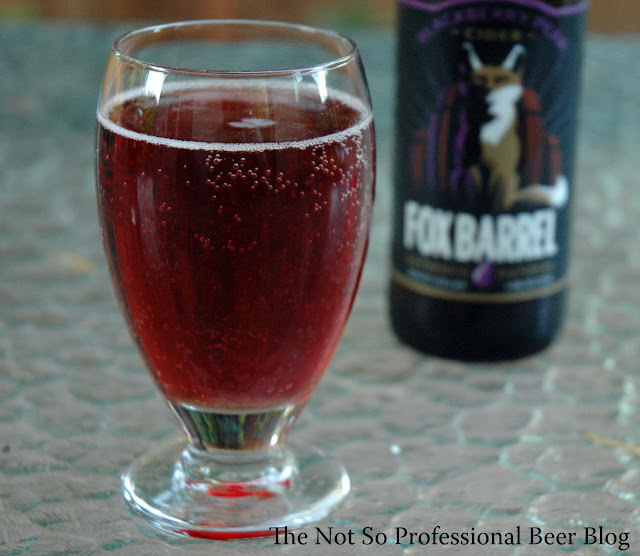 Have you tasted Fox Barrel's Blackberry Pear Cider? Haven't tried this one. Just starting to try some ciders. Have you tried 2 Towns from down here in Corvallis? Very good and with several styles. Nice change of pace from beer and wine. No, I haven't seen 2 Towns up here. I'll keep an eye out for it. I've been noticing more and more ciders recently. I agree, they're a nice change. I'll be sampling more! 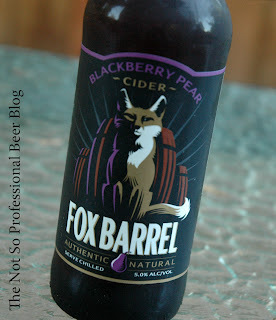 I loved the Blackberry Pear cider and now I cant find it anywhere. Hope you get to try UFF Cider (from Portland ME) while you are in town! Looking forward to reading you blog regularly. Thanks for the suggestion! I didn't get to try UFF Cider, but I did try one from Fatty Bampkins that I really enjoyed. Glad to have you as a reader! Cheers!